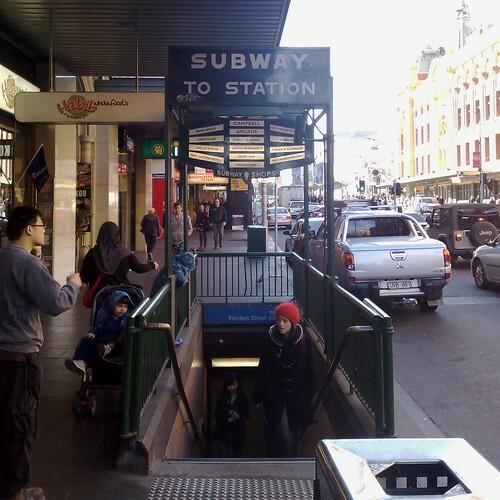 Subway — noun — Australian/British English — underground walkway, tunnel for pedestrians. Subway — noun — North American English — An underground railway. There’s some quite witty lyrics in there that went totally over my head when I was a kid, reflecting perhaps the love-hate relationship many users have with busy railways. This is very interesting. In England, they think of an underground railway as ‘The Underground’, as in England, the only well known underground railway is the London Underground. Hence, they think of a subway as an underground walkway as the have nothing else to make use of the word. In France, it has a universal word ‘Le Metro’, which is being more accepted around the world these days. In France, there are heaps of metros in lots of different cities (Paris, Lyon, Marseille, Lille, Toulouse etc. ), as opposed to England, which only really has one. This is the same for the USA, as there are number of ‘Subways’ in different cities. So if England builds more underground networks, they may adapt a more universal word which will mean underground railway such as subway (or metro). It seems that Australia (or at least Melbourne) has adapted ‘Metro’ with the new proposed underground link between Caulfield and Footscray. The other two English cities with Undergrounds are Liverpool and Newcastle-upon-Tyne. Newcastle uses the term “Metro” for its system (very modern, built from 1979 onwards). The Liverpool network is basically a central area extension of the suburban (former British Rail) system is is in some ways like a miniature version of the Melbourne Loop. It’s called either the Underground or (wait for this) the “train”! Very funny video. The NY subway system used to have a bad reputation for dirt and safety issues. The cars used to be covered wih graffiti. It has since improved since I last rode it sometime in 1990. The Chicago system is known as “the El” which is short for elevated railway. Most of the system is elevated above the streets on metal platforms but some lines (such as the red line) do dip below the ground when they enter the downtown (CBD) area and reemerge to more above ground tracks on the other side. Some of the lines also go around “the loop” downtown and back out again much like the trains in Melbourne do except that “the loop” is all above ground on metal platforms. The red line does not connect to the loop but instead passes under the ground in the same place. Both O’ Hare and Midway airports have an El stop which means I can fly into either airport in Chicago and easily use public transportation to get to my brother’s place on the north side. Patrs of the El can be seen in the classic movie “The Blues Brothers” The Melbourne system is more extensive and has many more lines than the Chicago system. “Metro” has spread into the US and is now common on PT systems (eg Seattle’s King County Metro, which is mostly buses), as well as systems that are actual metros (eg the Washington DC Metro). See this previous post on the use of this word.